Autogas is the safe, inexpensive way to run your car, especially as the family budget seems to get more and more stretched! Please use the calculator below to estimate your fuel cost savings†. Don’t you just hate having to fill up your tank in a week when the petrol and diesel prices are high? Think how much you could save each year if you could always time your purchases for the lowest priced days. If you are like me, driving a considerable distance every week, you frequently find yourself in a position where you need to purchase petrol or diesel while prices are at the high point of the price cycle. A few years back, when the price cycle was just one week, most people had the cruising range, on a single tankful, to make it through. Now the price cycle can be over 2 weeks long, exceeding the length of time you can go between fill-ups. One of the unheralded benefits of having a dual fuel vehicle is the extended driving range provided by having two fuel tanks. With both the petrol and LPG tanks filled, cruising ranges of 1000km or more are not unusual. So, unless you drive an extraordinary number of kilometres every week, you can cruise from low price point to low price point with a dual fuel car or truck, without having to refill in between. Almost all vehicles fuelled by unleaded petrol can be converted to LPG operation at a reasonable cost. These dual-fuel LPG systems allow a vehicle to operate on either LPG or petrol and can frequently double a vehicle's range. The petrol tank still remains in the car and the driver can switch from gas to petrol or vice-versa. LPG conversion MPG is affected by many things including the efficiency of the engine, weight of the vehicle, gear ratios, average trip speed, driving style, traffic density and delays. The percentages of Propane and Butane in the LPG also matter, but the differences would be small. With the exception of the percentages of the gas mixture, the remaining items are the same regardless of whether you are running the vehicle with LPG or petrol. LPG average mileage, LPG Conversion MPG or KM/L are measures of fuel efficiency. LPG average mileage shown below is from a hybrid real world test. 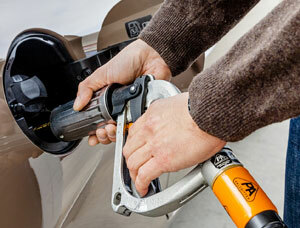 Individual results may vary based on driving habits, LPG price per litre and driving conditions. 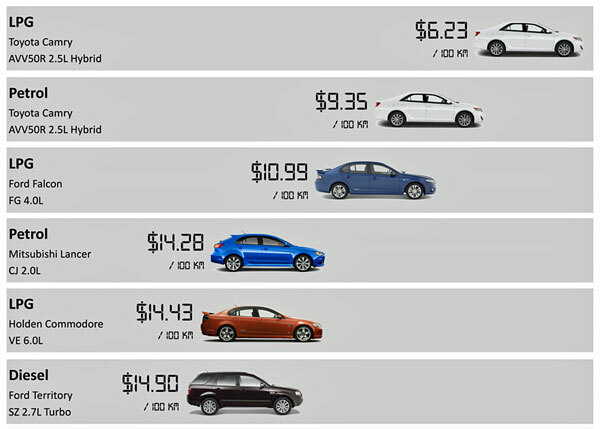 As explained above, each vehicle could have different fuel efficiency. In general, a car will consume about 20% more LPG, by volume. However, LPG price per litre is typically much cheaper. Assuming that the LPG price per litre is about half that of petrol, the savings still amount to about 40%. It is important to note that whilst mileage is expressed in miles per gallon, metric efficiency is usually measured and expressed in litres per 100 km. The LPG price per litre is still typically 50 cents to 65 cents per litre less than petrol. LPG price per litre also doesn’t bounce up and down, like petrol and diesel, with the weekly price cycle. Somewhere along the way, Australians forgot about LPG, even though the LPG price per litre is less than petrol. LPG price per litre is just much more stable, when compared to petrol pricing. Converting to LPG typically results in hundreds, if not thousands of dollars of savings every year, depending on your vehicle usage. This number could be even higher if you factor in avoiding the purchase of petrol during the high priced days of the cycle. LPG conversion technology has come a long way in the last few years. Liquid LPG injection offers advantages over older vapour injection systems. There are over 100 engineered Liquid LPG Kits for domestic and imported cars available from a number of Australian suppliers. The time required to install an LPG system varies. A typical family sedan, with a single boot-mounted tank, should take only one to two days. A large four-wheel drive, with multiple tanks, might take two to three days. Fuel costs based on fuel consumption figures for Falcon XT petrol sedan of 9.9L/100km and Falcon XT EcoLPi sedan of 12.3L/100km (both tested to ADR81/02, combined cycle). Data sourced from Ford Australia. Actual fuel consumption and savings will differ by vehicle and LPG price per litre.